Matthew is 6 years, 6 months old. Matthew weighs 66.5 lbs and is 51 inches tall. Matthew is shown here in the Britax Super Elite (now manufactured as the Britax Husky). Matthew's brothers Noah and Jacob are also harnessed past 40 lbs. Mom's Notes: I chose to keep them in a harness because our minivan is a 1990 and does not have shoulder belts in it. 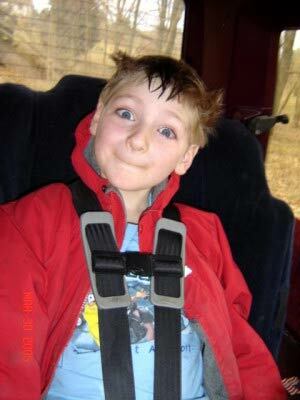 Matthew has neuro-behavior problems related to PDD-NOS and Early-onset Bipolar and a harness is a must for him.